What compelled you to join SpinSheet’s Century Club? I picked a copy of Spinsheet at Boatyard the day after I moved to Annapolis last winter. One of the reasons I moved to town was to get on the water more, so when I read about the Century Club it seemed like a natural goal to set. What was the breakdown by boat of your time spent on sailboats, powerboats, kayaks, or other crafts? Do you have a full-time job? If so, how do you find the time to get out on the water so often? My office overlooks the Severn. I don’t have the willpower to keep off the water with that view. Do you have a few days that stand out as the most special ones on the water this season? 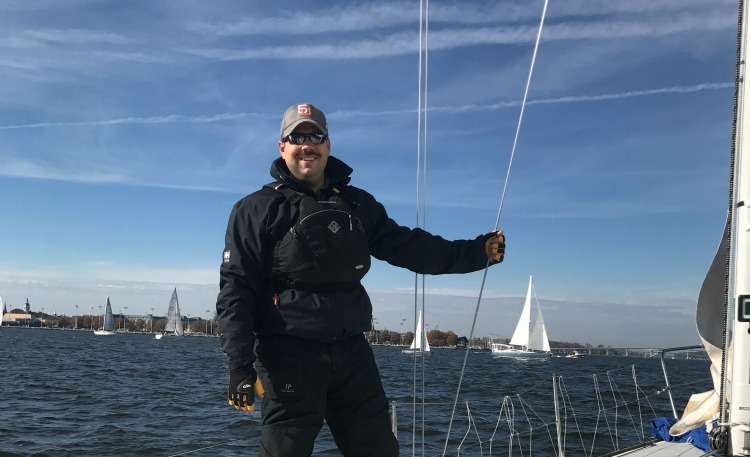 I was on the water a couple of days when the SAP 505 World Championship was going on, and it was amazing to watch that fleet sail. Racing in J/35 North Americans was memorable both on and off the water. Did you experience anything extraordinary? Maggie’s skipper keeping me on the crew after I accidentally sky’ed the main halyard at the end of our first race was nothing short of a miracle. What did you learn by spending so many days out there? Full moons on the Chesapeake are rivaled by few other places. What would you say to someone considering joining the Century Club in 2018? 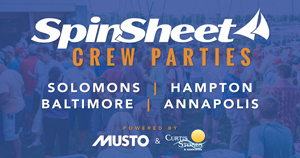 Go to the SpinSheet crew party in the spring. It’s a great time and easy way to find yourself on an amazing crew.